VANCOUVER, BRITISH COLUMBIA--(Marketwired - Feb. 29, 2016) - Monument Mining Limited (TSX VENTURE:MMY)(FRANKFURT:D7Q1) "Monument" or the "Company" is pleased to announce that the Burnakura Gold Project progressed aggressively including confirmation drilling over North of Alliance (NOA) and Tuckanarra deposits, open pit mine optimization, metallurgical test work for heap leach processing, crushing plant engineering design and environment studies; together moving forward to complete a full implementation mine development plan, in parallel with continuing exploration to demonstrate the economics of early production, and to increase the life of mine. The current production plan would have the heap leach facility circuit commencing operation first followed by the CIL circuit. A heap leach facility will allow a higher grade cut off to be used for the CIL, ensuring that only high grade ore is directed to the CIL plant. Lower grade material would be directed to a heap leach, so that the contained gold could be recovered economically. A crucial phase in the start-up of heap leach facilities at the Burnakura site is now complete. Como Engineers ("COMO"), a Perth based engineering company, have finalized the Front End Engineering Design ("FEED") Report. From supplied metallurgical data, it contains details for the design criteria, equipment lists, flowsheets, drawings, CAPEX, OPEX and schedules for COMO to supervise and assist refurbishing, constructing and commissioning of the heap leach plant. A major breakthrough for the project from the FEED report is the final crushing circuit configuration, with a design that has the capability of crushing the material for the heap leach facility and the Carbon in Leach ("CIL") plant when it is put back into production. Long lead items, such as quality refurbished secondary and tertiary crushers have been procured within Australia having the extra advantage of arriving in time to crush material for the construction of the heap leach pad. The plant and fixed assets have been kept in good care and maintenance order with a view to future commissioning. Site operations are fully functional for COMO to start construction works. Refurbishing, constructing and commissioning will take approximately six months. Continuous mine planning work, comprising pit optimizations, pit designs and the latest mining schedule have been prepared to assess economics. Mining contractors will be approached and cost will be estimated for selective mining to differentiate between lower grade to be directed to heap leach while higher grade will be sent to the CIL ROM pad. The bulk of the ore material will be extracted from Alliance and New Alliance pits first, and then NOA deposits, Federal City and Authaal pits, and Tuckanarra Project. Further confirmation drilling at North of Alliance ("NOA') deposits is progressing with certain indications that might be potentially converted to open pits. More studies are planned on those areas. Project development will continue in areas, such as infrastructure, where the laboratory will be upgraded to enable a larger number of grade control samples to be completed on a daily basis. Communications and IT network, are planned and proposals are in the final stages before installation. Warehousing software procedures are complete and procurement of first fill spares is underway. Administration, HSE and Security, workforce planning are in progress to support the production. Environmental permitting by Independent Consultants, Animal Plant Mineral (APM), has been ongoing. APM have been in discussions with the Department of Environment Regulation and are currently working on an amendment to the environmental license for the heap leach facility. It is assumed the application will be granted, due to the quality of the work from COMO and the internal activities being completed by Monument such as sterilization drilling of the area. In addition, APM have been working with Monument on the Mining Proposal for the Department of Mines and Petroleum for some time, collecting and collating data as it is available from mine planning. It is expected the mining proposal will be submitted in the next month, ensuring enough time before mining commences. The early stage gold production decision has been driven by the mineral resource estimate for the Alliance/New Alliance (ANA) prepared by under the "NI43-101 Technical Report on the Alliance and New Alliance Gold Deposits", prepared by Adrian Shepherd (MAusIMM, CPGeo) of Cube Consulting, dated on April 2nd, 2015, and amended on August 7th, 2015. Using a 0.5g/t Au grade cut-off an Indicated Mineral Resource of 1.88 Million Tonnes @ 1.6g/t Au for 98,400 ounces and an Inferred Mineral Resource of 0.10 Million tonnes @ 1.5g/t Au for 4,400 ounces has been reported. The Company focuses its exploration at the NOA and Tuckanarra deposits for the remainder of fiscal 2016 where the majority of historical resources were reported, aiming to study the possibility of developing several open pits, which might provide economic viability for the Burnakura gold production comprising of heap leach and CIL process. Additional regional exploration AC drilling is planned in fiscal 2016 at East of ANA (EANA), aiming to identify new resources for Burnakura, on a potential new mineralized parallel system to the existing ANA trend. At North of Alliance (NOA), a total of 42 RC holes for 5,944 metres were drilled to date (figure 1), plus 3 metallurgical holes for 312m. A total of 6,636 assay results have been received. The confirmation drill results have indicated a similar width and style of mineralization in comparison with the historical data/models. This total included additional infill and exploration drilling for NOA, already completed, which is now being used to extend resources with updated modelling in progress. To view "Figure 1. NOA drill hole plan within Burnakura Project" please visit: http://media3.marketwire.com/docs/1044836_Fig1C800.jpg. *The true widths cannot be determined from the information and data currently available. 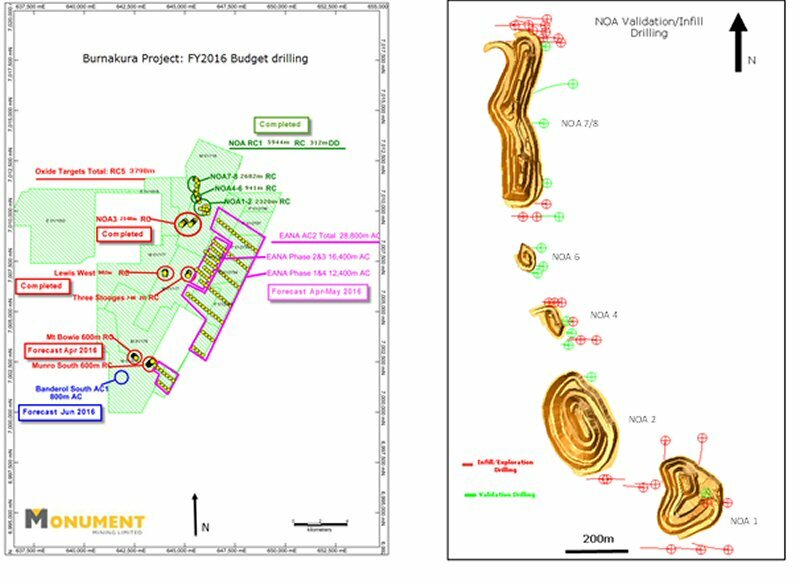 At Tuckanarra a FY2016 drill program was designed to validate the historical resource and gain metallurgical samples for test work including 27 holes for 1,613 meters RC drilling (Figure 2) and 4 holes for 316 m of metallurgical drilling. 1799 assay results have been received, showing a similar width and style of mineralization in comparison with the historical data/models. 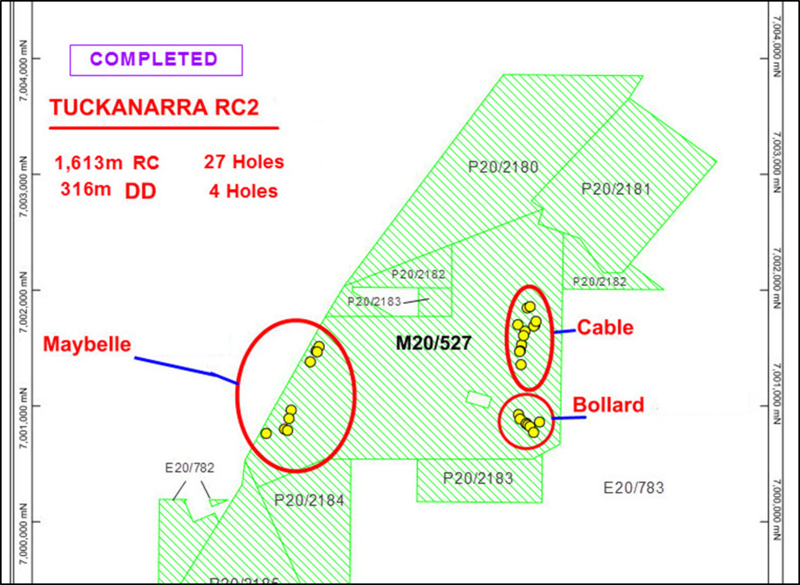 Successful drill hole twinning at Cable, Bollard and Maybelle areas occurred with a total of 9 targets identified for potential resources extensions at Tuckanarra Project. At Bollard there is a potential resource extension target below the current shallow pit. A follow-up drilling program to extend resources is being planned. To view "Figure 2. Tuckanarra Drill Hole Plan" please visit: http://media3.marketwire.com/docs/1044836_Fig2.png. During fiscal 2015 at Gabanintha independent Cube Consulting Pty Ltd. reviewed the historical resources data for potential targets. The result was drilling planned at Yagahong North, Golden Hope North, Kavanagh and Gabanintha Brownfields, which has been delayed by heritage issues. Surface geochemistry is also planned with target areas near Yagahong North copper/gold deposits showing a favorable signature in the HELITEM survey representing further potential for copper/gold resources. Roger Stangler, Chief Managing Geologist of the Company, MEng, MAusIMM, MAIG, has reviewed, supervised the preparation and approved the scientific and technical disclosure in the news release as a Qualified Person under NI43-101 standards.